A recent update to ride-hailing app Uber is generating a negative reaction online, with customers concerned over the company's decision to track their location "from the time of trip request through five minutes after the trip ends," no matter if the app is open or not. 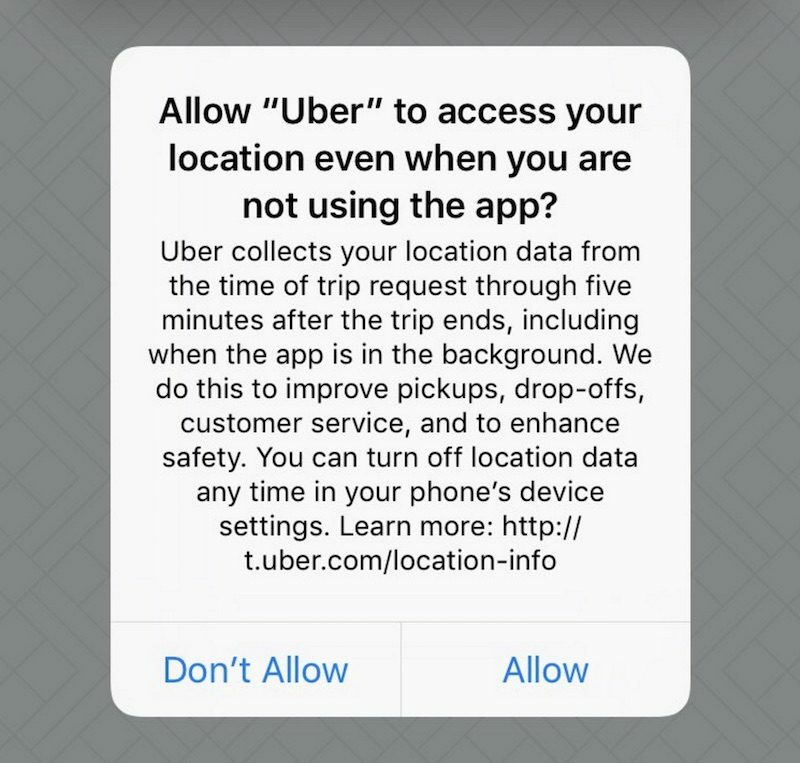 The only option now available for users to negate the background tracking of their location is to go into iOS Settings > Privacy > Location Services and opt-in to "Never" allow Uber location access through the iPhone. With no middle ground option of only tracking when the app is open, privacy advocates at the Electronic Frontier Foundation speaking with BuzzFeed News are now asking Uber to reintroduce such an option in the ride-hailing app. Uber said that tracking users five minutes after they leave their ride provides data that could improve the app's services, including whether or not customers are dropped off on the opposite side of the street of their destination, making them walk through traffic in the minutes after a ride. Deputy executive director and general counsel at EFF, Kurt Opsahl, said that some people will "have very legitimate reasons" why they would want to opt out of such tracking services. He also noted that Uber's solution -- turning Location Services off -- harms the usability of the app, which uses GPS to automatically send a user's location to a driver for pick-up. If users want to stay secure and turn off tracking, they have to input their location manually. Opsahl noted that the conversations with Uber are ongoing, but he and the EFF remain hopeful that the app will return to an option where user location will only be tracked when the app is open. Jay Stanley, a senior policy analyst at the American Civil Liberties Union, is also watching the events surrounding the update, and sees it as a potentially scary first step to even more invasive location gathering updates. For Uber, a company spokeswoman told BuzzFeed News that one of the biggest advantages of the five minute tracking update is that it "could also help customer service representatives investigate complaints or safety issues" raised by users following a ride. For now, the company has not indicated that it will roll back the update. If you don't like it, don't use Uber. Simple enough. I've never understood this reaction. If someone uses an app, and the app changes, why can't people say they're unhappy? Sometimes companies actually listen to user suggestions and complaints and actually make things better. It's the same "Love it or leave it pal" mentality that some people have about their country. If you don't like things the way they are, shut up or go somewhere else. Maybe you can find fault with something but still love it and want it to improve? I love it when uber agents/employees jump into the discussion to tell paying customers why they are a bunch of crybabies. I'm glad people are upset about this. Keep these guys in check. You want to know where I am? Say why and give me a damn good reason. So why can't Apple make it a requirement that any app that uses location have the three options of off always, on always and on only when using the app? Bam. Problem solved. And no one noticed because every update just says "we are always trying to improve our app". This should be an option! As an uber driver, I appreciate a way to prove that I 1) left the rider in the right spot and 2) can't be held liable for anything that happened after I leave as Uber knows where I am as well with the Driver app. And if you use any Google service on your iPhone, a lot worse tracking is probably happening than this. Not to mention Apple's own Location-Based alerts and ads setting. Sure they do. Again, this is not up to you. There is value to them in knowing your location from the time you make a request, to the time the ride completes. There is also value in them knowing it for a few minutes after. Just because YOU don't care about that, does not mean they do not, and does not mean the value doesn't exist. See, that's the thing about capitalism. Uber is clearly trying to maximize their value proposition (on their side), which is fine. But where it gets ugly is when they do it by monetizing your privacy with nothing in return. But that's the other beauty about capitalism - Uber has competition. If enough people go back to taking cabs, busses or Lyft, then Uber will either reverse this decision or go out of business. Frankly, I'm not happy with Uber, Lyft, AirBnb... all of them are effectively trying to take over an industry while ignoring all of it's "inconvenient" costs and claiming that magically the rules don't apply to them. Allowing the App to track you when not using the App can mean a lot of different things depending on how the service and App are designed. It does not have to track, or keep tracking, for any length of time. So, introducing the "While Using" option is not a solution, and is not efficient for this particular App. The 5 minutes is an intentional choice made by Uber. The App knows when the ride completes, and tracks for 5 more minutes because Uber wants that data. I don't abide the "fauxrage" crowd that demands to use the service but not be subject to its terms. Uber can garner a lot of valuable information from that tracking detail and can use that to better protect its users and improve customer service and safety. People ought to not be so quick to enact that tunnel vision fauxrage and actually give an example of why they think this is bad or puts them at risk. Doesn't matter. I want a minicab to take me from A to B and I pay. Besides payment I have no obligation to provide a damn to uber. I agree, and Uber is not the only app that does this. Apple should make it mandatory to publish proper release notes with every update. It should be one of the app guidelines they review when approving updates. Most people are clueless to what has been updated in a bug fix. The vast majority leave their phone in the default state which installs updates automatically so they never even see the notes. As a developer it's a pain to keep those notes for the public and it often leads to more issues. With most not reading them and the majority of those that do not understanding them anyways, there's little reason to include them. Sorry. Too bad man. That sounds like "it's too hard to do my job, so I'm not going to do it." As a developer, you should also be documenting what changes are being made. It's not too much time to convert those into an easily digestible bullet-point list of changes that affect the user experience. I can understand that a solo developer shop might not have the wherewithall to do this, but a huge company like Uber has no excuse. In a few months they'll probably discover "value" in tracking people 24/7, and silently add it with another "We always try to improve our app" update. Brave new world. As an Uber user, I COMPLETELY agree with this. I can always shut off location to the Uber app or my phone as a whole, if I am 'uber'-paranoid, but I think 5 minutes is a reasonable duration for them to 'know' I got to my location safely. The problem is that once you allow them to always track you, you lose control. Even if you were OK with the 5 minutes, who says they won't make another change in the future to expand the tracking further? I don't allow any app to track me 24/7 in the background. If the Uber app no longer works well without giving them unlimited access to my location, it's good bye Uber for me.